Ordering and delivery from Tayna. Top marks. Battery ordered doing exactly what it said on the tin. Filled with acid soloution and it was ready to go. Started engine straight away. ???????????????????? 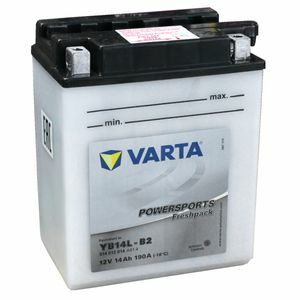 An excellent priced battery for my motorbike. Arrived very promptly. Good fitment guide to establish correct battery to purchase. Fast delivery. Good price. That is the service I was looking for and that was what I got! This battery has so far performed very well. My motorcycle only gets used once per week so the battery needs to be top notch which it is. Fires up my bike first time no messing. Exactly as offered and delivered as promised.